Image provided by Kawasaki Engines. 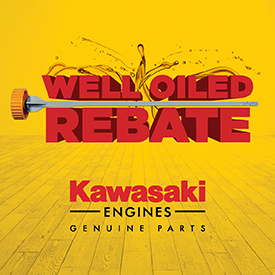 Get up to $20 back with Kawasaki’s Well Oiled Rebate. For a limited time only, purchase Kawasaki Engines KTech™ oils and filters from an authorized Kawasaki dealership and be eligible for a rebate. Kawasaki KTech 4-cycle oil is API SL and JASO MA certified and made to combat wear and tear on your engine. Kawasaki 2-cycle engine oil is a synthetic blend that meets and exceeds the rigorous requirements of API TC, JASO FD and ISO EGD classifications for 2-cycle air-cooled small engine applications. Learn more about eligible products and rebate amounts at www.KTechRebate.com.